October 30, 2011 by Alphageek in "alphageek", "cooking", "discovery"
We have been writing a lot of restaurant reviews lately. After all, the reviews are what get people to the site. They could come for the witty and humorous insight into all things food, but massive numbers of readers is not yet happening. I asked a friend why he did not read much, and he said it was because he read slowly. He also pointed out that there are not enough non-food review items to keep his interest, because he lives far away from the location of most of the reviews. We are going to try write some new items up for you. There is an extensive list of geek centered articles that are going to be written, and the articles should provide a means to show off the wit you have come to love. Today, we are going to show off the smoker results here. Using the smoke is one of those "big deal" projects here. The thing has to actually be clean before you put food in the smoke. The food has to be prepared properly, and then the smoker has to be cleaned after use. We make no claim to making great food in the smoker. After all, smoking is the kind of thing that cause people to use pistols at forty paces and other such things. We pretty much rub the meat in some sort of dry rub, put the meat in the smoker, add some wood chips (the smoker is an electric smoker) and let time take care of the rest. Mrs. Alphageek brought home the jowls of a pig that won the Louisa County 4H contest at the county fair. At leas, that is what she told me. We took the jowls, and let the jowls sit in the freezer for months. About a year later, we realized we were going to get cuts from the next year's winner, so we needed to clear last year's winner out of the freezer. 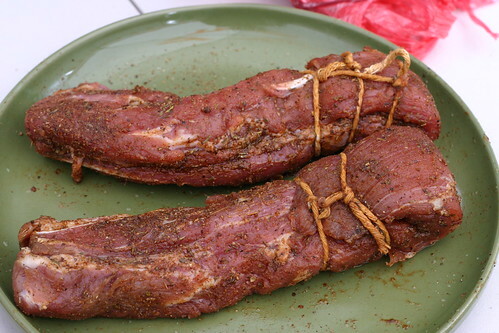 We used a basic rub, and tied the ends up, to help cook the jowls more uniformly. Through the magic of the internet and pictures, you can see the results below. 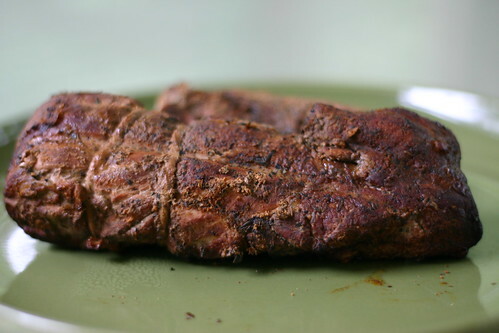 Think of this cut as a really good tenderloin. The meat just melted away in the mouth, sort of like a milkshake that is gone all too quickly. The small cut allows for more smoke flavor to come through, without getting overcooked. The magic of the meat thermometer comes through again. We were inspired to try this cut because of the original Iron Chef. That would be the Iron Chef that was filmed in Japan, with the great voice overs and the Real Chairman. On a particular episode, one chef mentions that the tuna's best meat is on the cheek, because the cheek does not get over worked while the fish swims. We thought that could apply to the pig too. Smoking this pig jowl made for a great experiment that everyone should try and we loved the results. What have you smoked? Why not leave some feedback and let us know.